The Fly is a seminal film. David Cronenberg directed a George Langelaan adapted short story (screenplay was by Charles Edward Pogue) and made it into a film that makes your skin crawl 30 years after it was first released. (1986) This book comes out fortuitously. I just watched this movie last week so the images and creepy-crawly feelings are still pretty fresh in my mind. The way the tension is built in the film is fantastic. The audience knows that something is up; we all saw the fly in the chamber and notice the changes in Dr. Brundle’s character. Then later, when he begins to suspect, and embraces it, continues to travel through the transporter, only solidifying the fly DNA with his, it becomes more of a freak show because we see that he is choosing the fly aspect rather than his humanity. The Geena Davis character was pregnant at the end of the film, and this comic begins with that man, an “almost human” son searching for the cure to his mutated genes. Is this comic a sequel? Is it a reboot? 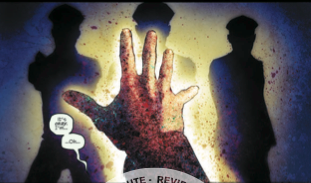 In The Fly: Outbreak #1 Brandon Seifert (Witch Doctor) takes a tack that I wouldn’t have guessed at but works. He’s made the fly DNA a disease that can be transmitted between people, and the son of Dr. Seth Brundle, Martin, a carrier of said disease. It makes the highly contagious aspect of his condition more real and the military-type restrictions on his lab all the more important. Art was provided by menton3 (The X-Files: Season 10, The Squidder) and has photo-realistic qualities that really echo the stark quality of the film. The great look to menton3’s art brings back that creepy feeling that Cronenberg established so well in the film, and because of that makes this a truly good sequel. The question that always comes up with a licensed property like The Fly is does it need a reboot or a sequel? My opinions on this have changed in the last year or so. I used to be staunchly in the camp of “don’t touch my loves.” Don’t remake a film that was so good, such an ingrained part of my childhood and growing experience, because it will not be the same. OF course with a reboot that’s the point. It’s not the same film and isn’t meant to be. Reboots don’t bother me as much anymore, as long as they’re done with the original in mind. Sequels…well if the Indiana Jones franchise is any indicator, sometimes it’s best to leave it at a trilogy. But for all of it’s faults, that fourth film is part of the series, and it holds a place with the rest for me, no matter how many aliens showed up at the end. I guess the complete statement is that when sequels or reboots are done by skilled people who are fans of the original, then only good can come of it. It’s another chapter in a story that you love, and who doesn’t need more stories? The endpoint of all of this is that this book, The Fly: Outbreak #1, is a sequel done by a fan. Brandon Seifert has the best intent here and skillfully executes a new chapter in a creepy universe. This entry was posted in Brandon Seifert, Comic Book Reviews, comic books, IDW Publishing, menton3, outbreak, The Fly, Tom B. Long and tagged Brandon Seifert, comic book reviews, comic books, idw publishing, menton3, outbreak, The Fly, Tom B. Long. Bookmark the permalink.